Property Size 2,025 sq. ft.
Hula Hangout offers excellent gulf views to the south and a nature preserve to the North. 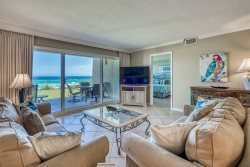 Located on a quiet street on the north side of Hwy 30-A, the 2,100 square foot, three story beach house is perfect for a family vacation get away. Bring your pet and enjoy a walk or bike ride along the pedestrian friendly streets of 30-A. Shopping, restaurants and amenities of Gulf Place are just a short walk away. The open living room was just re-furnished, making it even more cozy than before. The kitchen is fully equipped with everything you need, including stainless steel appliances and granite countertops. Or if you prefer the outdoors, you can fire up the grill and relax on the spacious back deck. The home also comes with 4 adult bikes at no additional charge. Add $215 for housekeeping and 11% for tax. There is a $69 damage protection fee, $30 Booking Fee, and 2.09% to process credit card payments. A deposit of 25% is due at booking and will be applied toward your rental fee. Full payment is due 30 days before you arrive.